This post is sponsored by Grand Central Bakery, a company I love and enjoyed for many years! Thank you for supporting the brands that keep The Kitchen Paper up and running! I close in less than two weeks (am I jinxing this by writing about it before actually closing? uuuuh fingers crossed no), have a gaggle of wonderful friends ready to paint the new place, load up, and unload our current apartment into our new place. I almost just said “final resting place” and then decided that was morbid. This will hopefully not be my final resting place, but hopefully my final dwelling place for quiet a while to come. I’ll be posting all sorts of pictures, I’m sure, as we make it ours (if you’ve seen my pinterest you know that’ll probably mean white walls and all the plants!). I’m currently trying to figure out exactly what the rest of it will look like (what rugs!? what side chair in the living room!? what dining room table!? OMG WHAT RUGS!? ), but also feel no rush — we can move in and slowly piece it together and still be totally comfy there! One thing that will absolutely continue in the new place: cooking delicious dinners like this one! 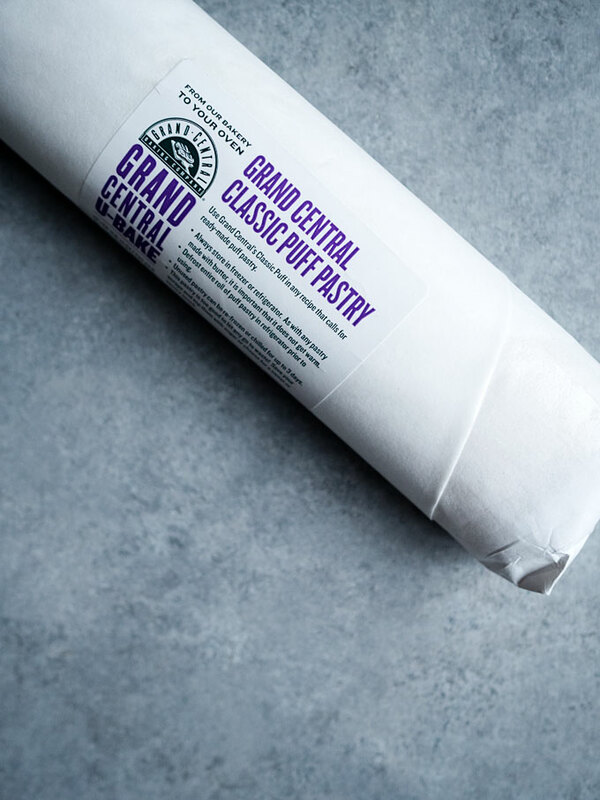 Last year I was lucky enough to go to one of the Grand Central Bakery locations here in Portland and play in their kitchen for an evening using their frozen puff pastry. They make it, roll it, freeze it, and sell it! You then get your roll of deliciously flakey puff pastry and make your life 10000x easier than making your own, amiright? Srsly. 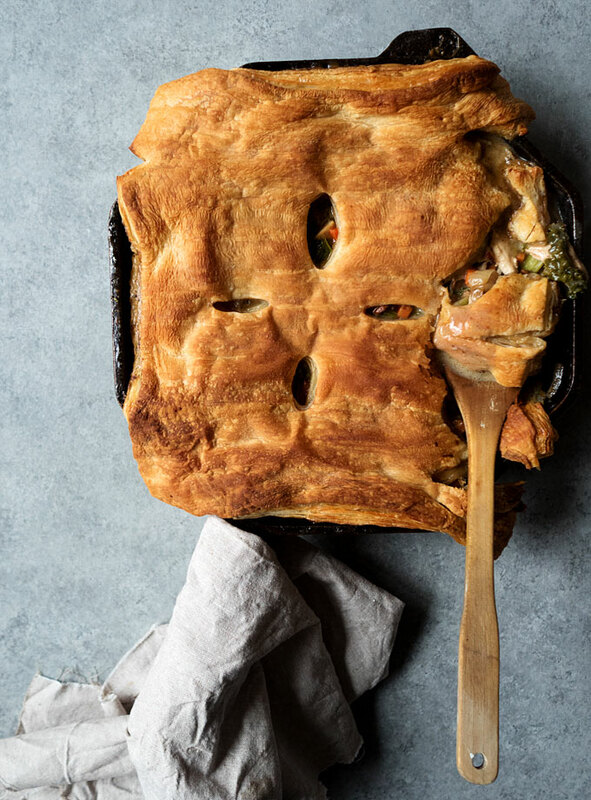 This year, after foraging for mushrooms and loving all the fall Oregon produce, I wanted to use their puff pastry as the top to a pot pie. HOW FUN IS THIS?! I was thrilled. It’s a slight twist to the familiar pie crust (which GCB also makes and sells frozen! ), and a super fun one! 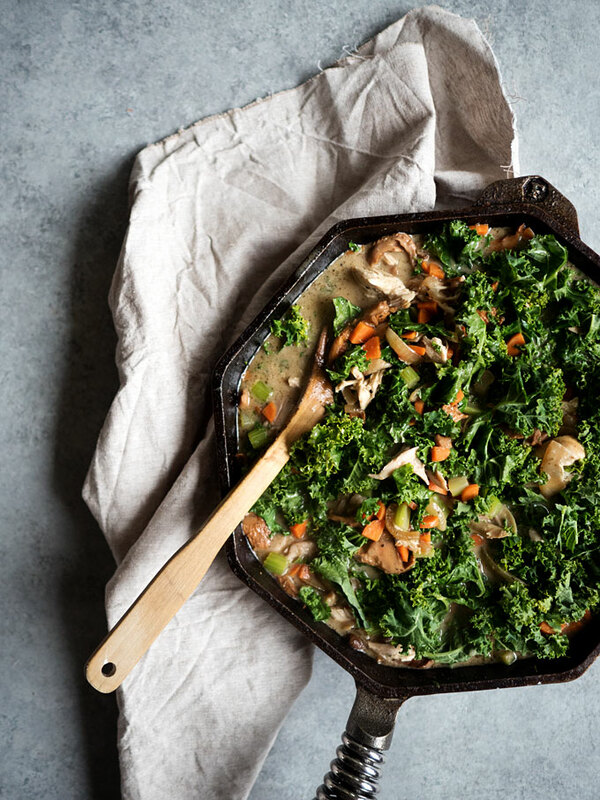 Before you start, make sure your skillet is big enough to accommodate everything. If it isn’t, pare the recipe down slightly to fit. 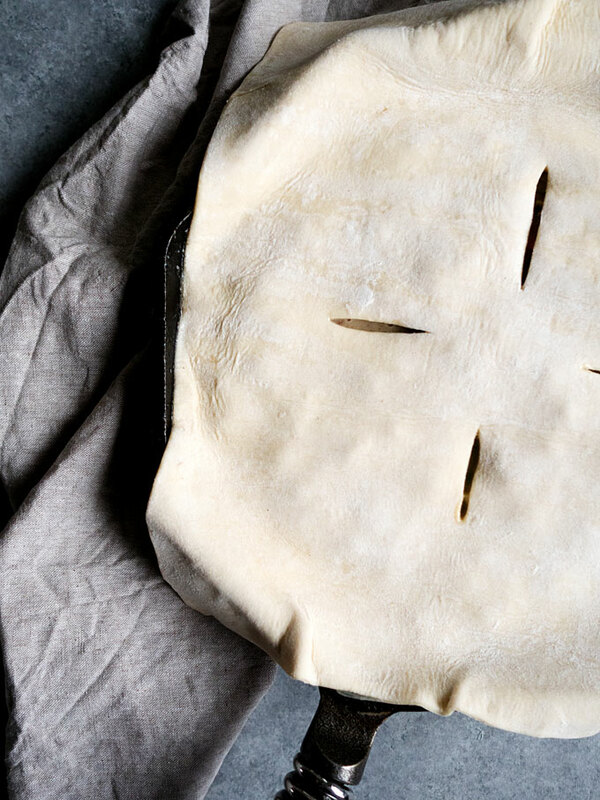 Also, prepare the pastry: roll it out slightly, to even it out, and cut it to fit your pan (with an inch or two overhang). Place it on a baking sheet and keep it in the fridge while you cook. Get the skillet nice and hot over high heat on the stove, then add 2 Tbsp butter and the sliced onions. Cook, stirring frequently, until they’ve browned and caramelized a bit (about 8 minutes). Reduce the heat to medium, then add the remaining butter, carrots, and celery. 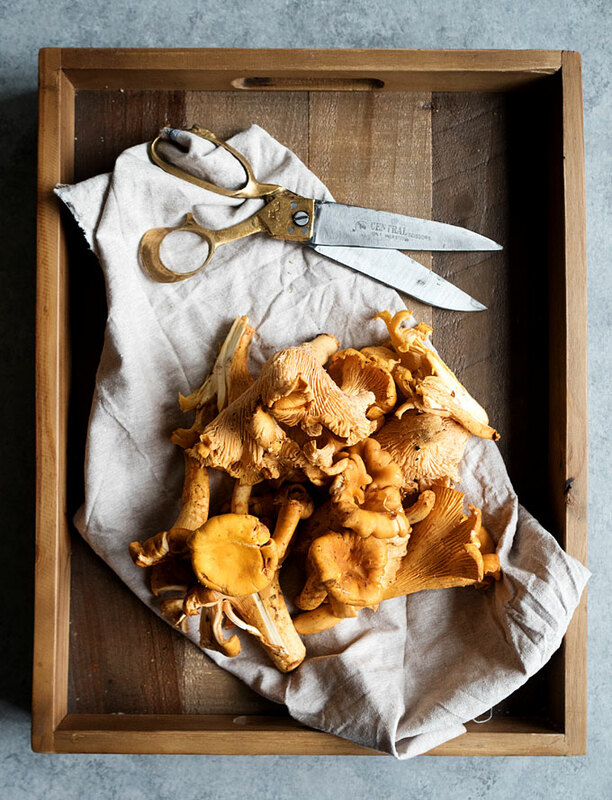 Cook for 3-4 minutes before adding the chopped chanterelles. Let this mixture cook for 5-8 minutes, until the mushrooms are all softened and some of the moisture has evaporated before sprinkling the flour over the vegetables, and stirring to combine. Stir continuously, scraping the bottom of the pan, for 3 minutes. 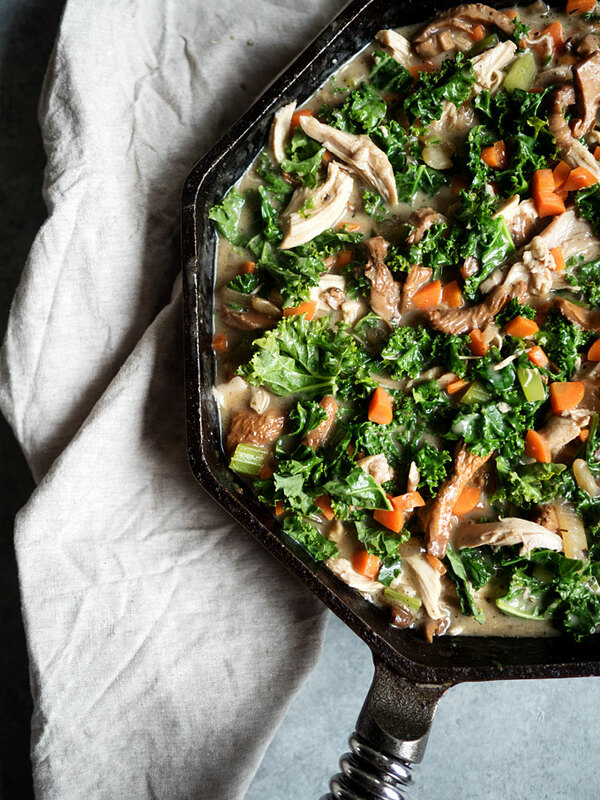 Gradually pour in the chicken broth, using your spoon to vigorously scrape the bottom of the pan (to get all the flavorful bits off of the pan! ), then add the chicken and bring the mixture to a simmer. Season with salt and pepper, remove from the heat, and stir in the chopped kale until mostly wilted. Add the half & half, stirring again to combine. 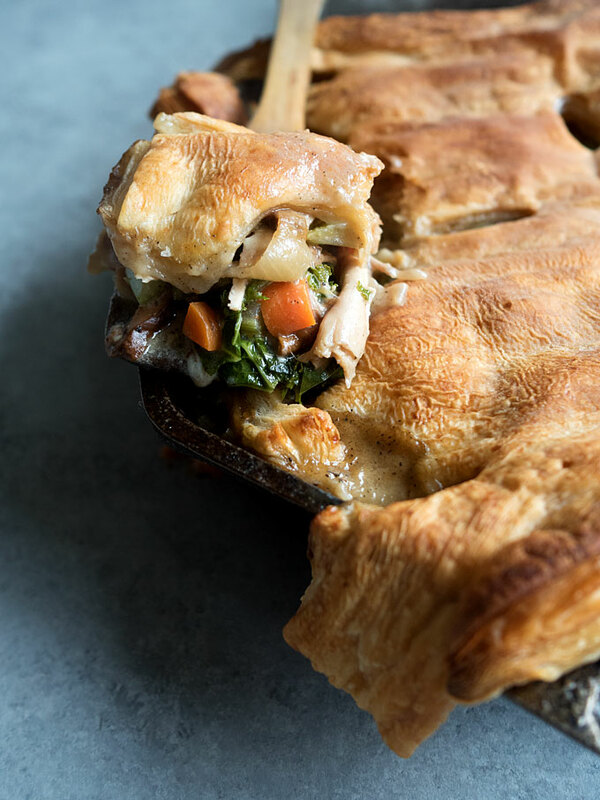 At this point, cut a few vents in your puff pastry, and (work quickly so it doesn’t warm up too much before going into the oven) lay it over top of the skillet. 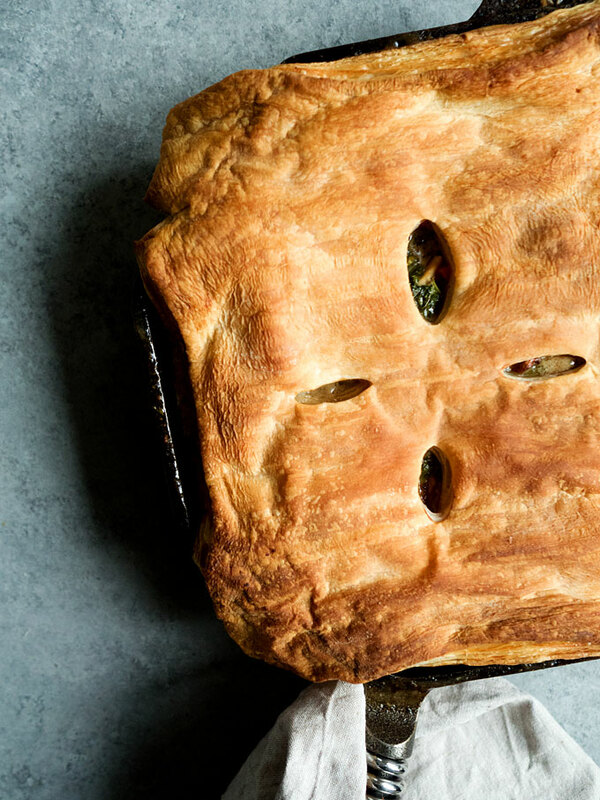 Put it immediately in the oven and bake for 30-40 minutes, or until the pastry is golden and the pot pie is bubbling. This looks delicious Will add it to my weekly dinner plan.